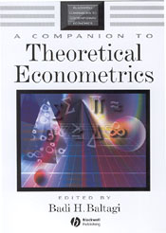 A Companion to Theoretical Econometrics provides a comprehensive reference to the basics of econometrics. This companion focuses on the foundations of the field and at the same time integrates popular topics often encountered by practitioners. The chapters are written by international experts and provide up-to-date research in areas not usually covered by standard econometric texts. Focuses on the foundations of econometrics. Integrates real-world topics encountered by professionals and practitioners. Draws on up-to-date research in areas not covered by standard econometrics texts.